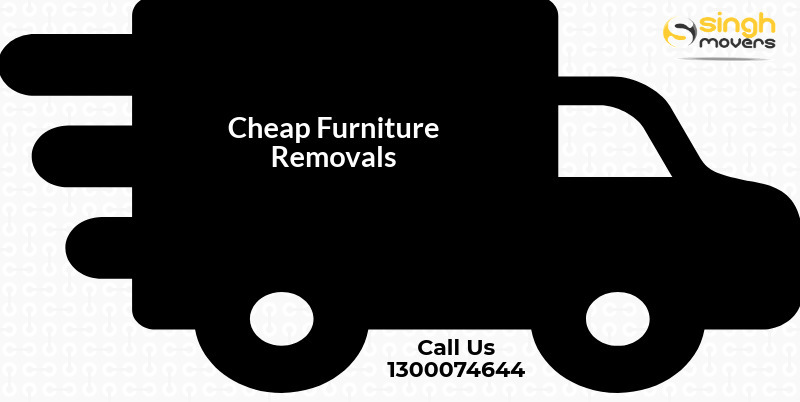 Are you in search of cheap furniture removals? Furniture removals are a tough and complex process. It can't be done by a layman. It requires a lot of efforts and skills. Hiring a professional for furniture removal is a better option. It lessens your burden and makes your move stress-free. Furniture removals involve packing the items, loading the items and uploading the items and setting them at the destination. For safety moving, you require the best moving strategies. Professional has the best strategies and techniques to the safe and timely arrival of items. Singh movers and packers are the cheap furniture removals who provides you with best and quality service. We have Melbourne cheap movers team of experts who are having experience in the moving furniture industry. Our main aim is to offer safely and timely delivery. We are available 24hrs in a day and 7 days a week. We never charge extra for weekend service. We are focusing on analysing the customer's needs and preference so that we are able to provide them with customized service. We tailor the service that fits in your budget. Singh movers and packers are one of the reputed removal company Melbourne who provides finest and cheap removalist. We are invested in the special equipment and tools that help in providing safety to your items. We provide local and interstate removal service, pre-packing and packing service and short or long-term storage service. So if you are planning to relocate and finding any affordable moving Company Melbourne then Singh movers and packers are the best options who provide you with the finest and perfect removal service. Singh movers and packers are the best finest and quality removal company who offers effective and efficient service. We use the state of art equipment which helps in providing safe service. They are the cheap furniture removals. Relocating can be successful with team-work. It can't be done by a single person. For a successful moving, there is a need for professional knowledge so that moving can be done on time and with proper safety. It is better to hire professionals for moving service. If you are planning to relocate and searching for the professional and reliable furniture removalists Melbourne then Singh movers is the one who provides you with the best service. We have a team of experts who provide you with various packing and moving service. We provide budget-friendly and cheap furniture removals service. People have to face many difficulties in moving process. We will take all your worries and help you to cope up difficulties. For the easy and smooth moving, come to us we help you in moving service. Our moving service includes packing, transportation, loading, unloading, storage and rearrangement of your items. Singh movers & packers are the leading Company who provides best furniture removalists service Melbourne at actual and real prices. Our main focus is on providing high-quality service and gives satisfaction to customers. We at our backend have a team of experts and professionals who are hard-working and loyal towards their job. We are dedicated to making the situation easy and stress-free with their experience, quality service and technique. We will help you in the entire operation from packing of the items at the present door step to unpacking of the items at the new doorstep. We work for the whole day and week and never charge extra for weekend service. We are the best and cheap furniture removals who help you in relocating. Our movers fulfil all your furniture moving needs. We always work with sincerity and honesty. With the years of experience in the moving industry, we know how to pull off the perfect move. Our professional removalist crew is fully trained who are polite, hard-working and loyal towards their job. Our moving trucks and cargos are fully equipped with the right tools to the move. We are doing moving with proper planning and organizing. Singh Movers & packers help their clients in making your move process easy and comfortable. We are always present to help customers. Our attendants are present to answer the queries and doubts of customers. Our prices depend upon the distance of travel and other moving activities. Our price system is not hidden from the customers; it is transparent. Door to door charges only: We will charge only for the door to door moving. We will not charge any extra cost. No fuel charges: Our loyal customers will not have to pay fuel charges. We will offer you the facility which we have and will not charge extra for that service. No depot to depot charges: our customers will not pay depot to depot charges as our professional team will reach your place at their own cost. Professional tools: we will use safety measures so that your items are safe. We will do our work with proper safety measures and using professional tools. Our professional tools are a trolley, dollies, heavy duty blankets, toolkit for assembling and disassembling furniture, ropes etc. No hidden charges: we have shown all the prices in front of customers. We don’t charge for the sake of money. We believe in providing quality work for the company success and happiness of customers. We provide these services to our loyal customers to retain them for a long time. Professionals reduce your burden of moving. They will do the activities of the moving process. It protects your items from breakage, dents and lost. It provides safety to your items. Your items are properly packed in packing boxes. Packing materials will be provided by the removals company. They pack your items with proper care. They ensure to provide you safely and timely delivery which saves your time and cost. They take away all your worries and tension as they take all the responsibility of the moving process. They take care of the entire operation of the move. Your items are also insured while moving. These are the benefits which you get from moving professionals. Singh Movers and packers are the best and cheap furniture removals. We have reputed and well-established removal Company Melbourne who offers you quality and efficient movers in Melbourne & services. Packing and unpacking of all material is a very time-consuming task. With house removals service of Singh movers & packers, you will get the good packing service. Our packing staff will make sure that your furniture and material is under the great protection which reduces the chances of damage to the material. Our packers are come with the various types of packing materials and have full knowledge about the packing. There are many fragile items that need more care and attention. Our professionals are fully trained in the proper care and protection of handling the items. Our storage and packing service is also planned while keeping in mind the protection and care of your items. Singh movers will give necessary care and protection to your items while moving. Before giving the removal service to customers, we determine their removal needs so that we are able to provide you customized move. We inform you at each stage of the move so that you know what is happening. Our highly trained movers provide you with reliable and trustworthy furniture removals. Why choose Singh movers for cheap furniture removals? We are one of the finest and reliable furniture Removalists who provides you with cheap furniture removals service. We Handle All Types of movers: We handle various types of move. All the following moving options are available for you. Long Distance Moving: If you want to move it across the country or state our mover will help you out. Interstate Moving: Moving from one state to another is a big deal and our mover will know the exact what to do. Our movers will have a great experience with the interstate move. Commercial Moving: Moving of business is a big decision with your all documents we have a special team of commercial moving. WE OFFER PACKING SERVICES TOO: In addition to our high-quality moving service. Professional movers have service of packing of goods also. Our packing material is also of good quality so the goods can't be a break. Our team has the experience which needed to ensure the packing goes quickly and safely. SAVE TIME: We will also save you time. We provide you with timely and quick service which saves you a lot of time. AFFORDABLE PRICE: We provide service at affordable price and also provide you with a service of packing. This is why we work hard to keep our prices low for all our customers. We do not have million-dollar for ad campaigns and national headquarters that require to be paid for, so we can pass those savings along to our customers. We provide cheap furniture removals. Provide insurance for goods also: Our Company also provides insurance to your goods as the same condition at the same place. Safety goods: last but not least it is first to provide safety to goods from one place to another. We use special equipment and packing material to provide safety to your items. Speed service: Our Company provides speed service and door to door also. Shift with the top condition: our company shift your furniture with the same condition. Your items are in proper custody. We ensure that your items will not get harm. So, come to Singh movers and packers for the cheap furniture removals. Give us a chance to help you with moving. For more information on furniture removals and Storage Services don’t hesitate to get in touch to one of the Expert Team Members or representatives on 13000SINGH OR 1300074644 for a free obligation quote from the Singh Movers Team, simply fill out our quick quote form or write an email or call us directly as per your convenience. Our Head office is located in Melbourne and Singh Mover's offices are spread across over other major cities: Sydney, Adelaide, Brisbane, Canberra, and Perth.